Cookies & Beer: Come on In! It's high time I took you on a tour of our new house. I snapped these photos on move-in day so I'd be sure to catch everything in its original state. Welcome! We really hope this house will be our "forever home," so we're trying to be extra thoughtful about what we do here. But there are definitely some small updates already in progress. Almost all of our immediate plans involve a paintbrush. And some sweat (and tears?? ), but not much more until we've lived here long enough to decide if we want to invest bigger renovations. 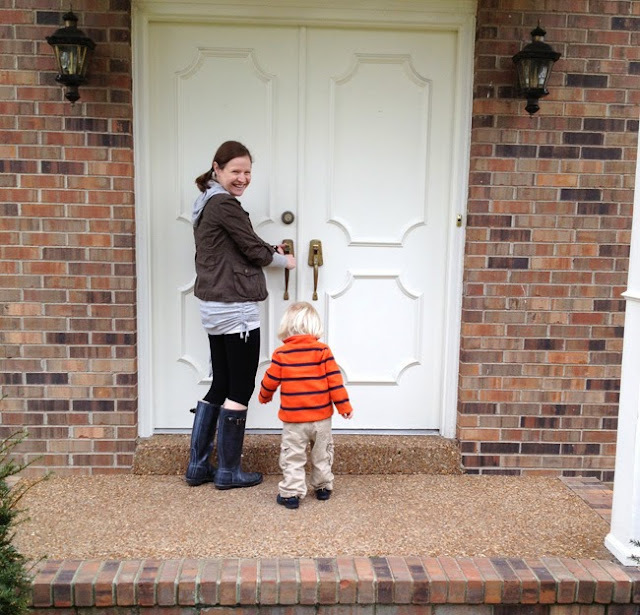 I was about eight months pregnant on closing/move-in day, and you can tell from my goofy grin how insanely relieved I was that we'd actually succeeded in our crazy plan. For the first time in our lives, we have TWO floors. Crazy! 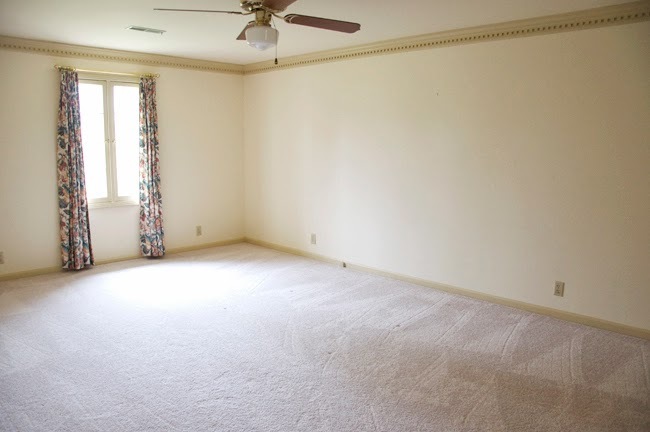 As you can see, things are very... beige. If you know Ben and I, you probably know that's not really our thing, but it's nothing that paint can't fix. 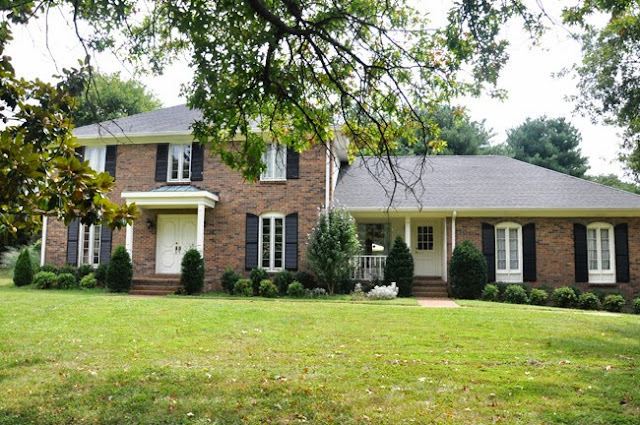 To the left of the entry is a formal living room; we envision this doubling as an office space. 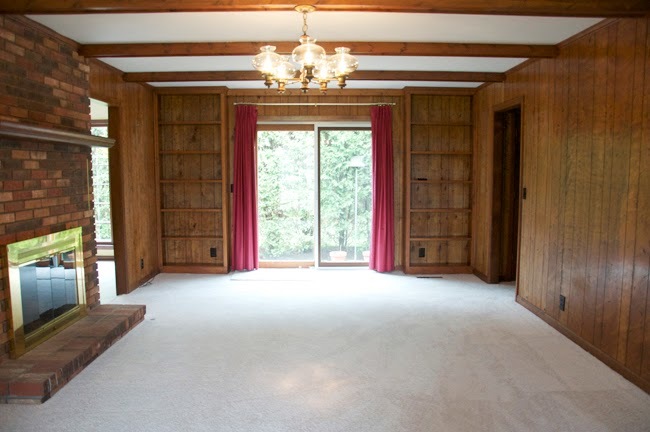 I'd love to put a built-in desk in there with walls of shelving around it, and some glass doors in that wide door frame, since I like to entertain fantasies of working from home one day. And for the record, Ben rocks. He surprised me for my birthday last week by hiring a professional to paint all of the trim and doors. Buh-bye, beige! Our house has tons of dental molding, so we always knew this job was one that we'd avoid DIYing at all costs. I figured I'd have to wait a long while, so am beyond excited to turn that trim white sometime this month. I'm convinced that it will 100% transform things. To the right of the entry is our formal dining room. It's big enough to fully extend our beloved 12-seater dining table that's been passed down from my mom's family, so I'm pumped to host some big gatherings here. That door goes to the den, and will probably come down in the long run, but it's nice right now for blocking out noise while the kids are upstairs napping. 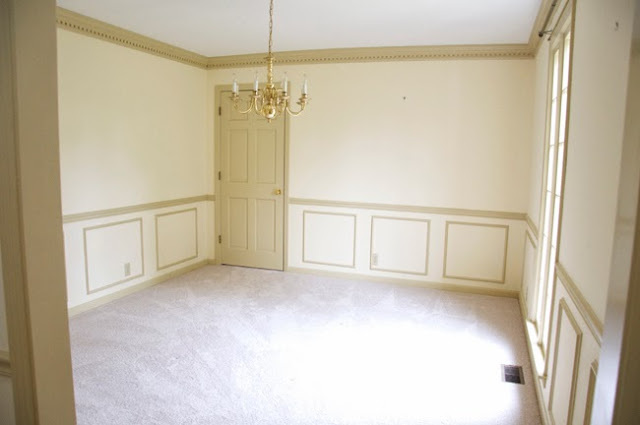 And check out the molding in this room, I love it. I'm picturing something bold, like bright white on the bottom half of the walls, and navy on the upper half (pretty much exactly what I did in our old house before I "neutralized" it to sell). The carpeting in here extends throughout the whole house except the kitchen, and I have to admit it doesn't bother me as much as I thought it would. It's actually nice for small children. 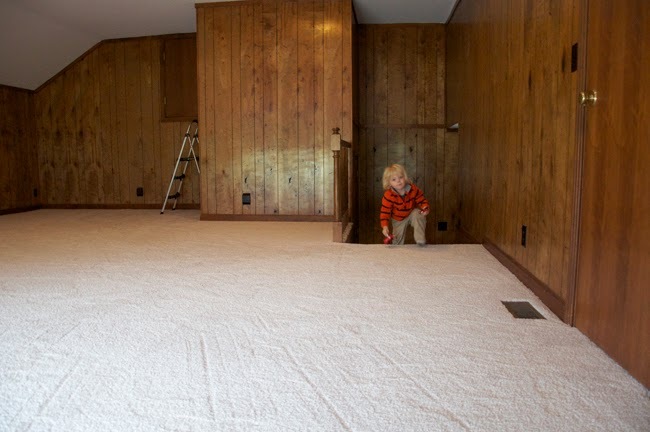 We figure we'll get through toddlerhood with both kids, and once we've given this carpet a good run for its money, we'll look into hardwood floors for all the main living spaces. 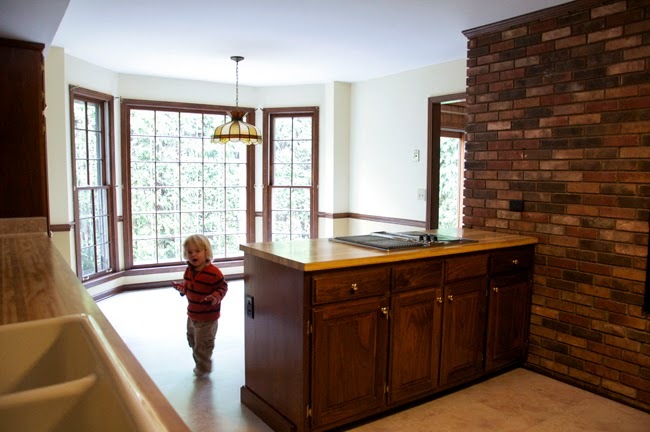 The kitchen is accessed either through the dining room or a little hallway that leads off the entry. This is another space that will see lots of paint: on the cabinets, walls, wood trim, and we've even discussed whitewashing the brickwork. A new light fixture is on the way, thanks to a fabulous birthday gift from my parents! Our breakfast nook is really spacious and I love the overall size of our kitchen. 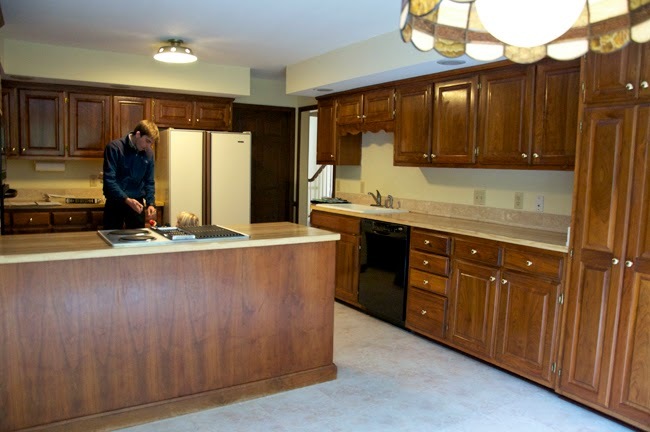 It will get basic upgrades little by little, like new appliances, painting the cabinets and wood trim, updating hardware, and playing around with the idea of open shelving over and around the sink. Anything beyond aesthetic, budget-friendly updates likely won't happen for many years, though. 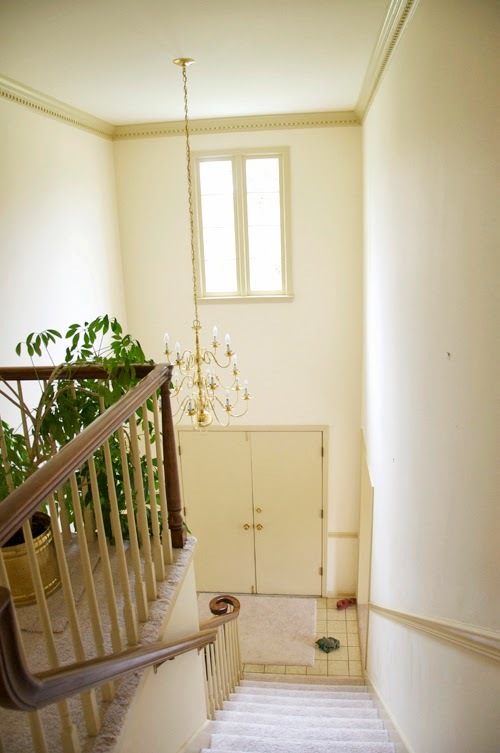 You can see in this photo the two doors in the corner leading to the dining room and entry hall. 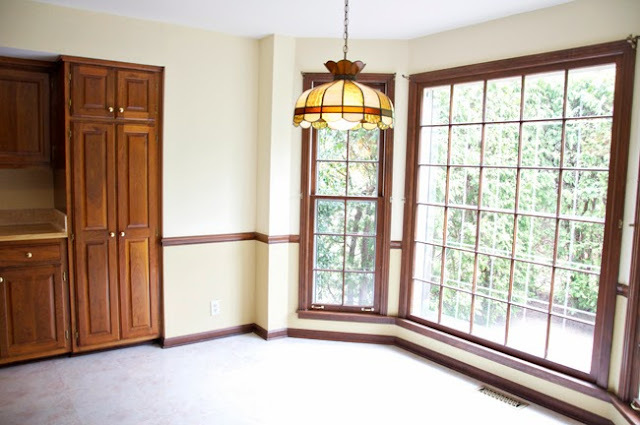 In my fantasies, we'd remove the doors/walls in that corner and just have a large column separating the spaces so it would be almost totally open to the entry and dining room. 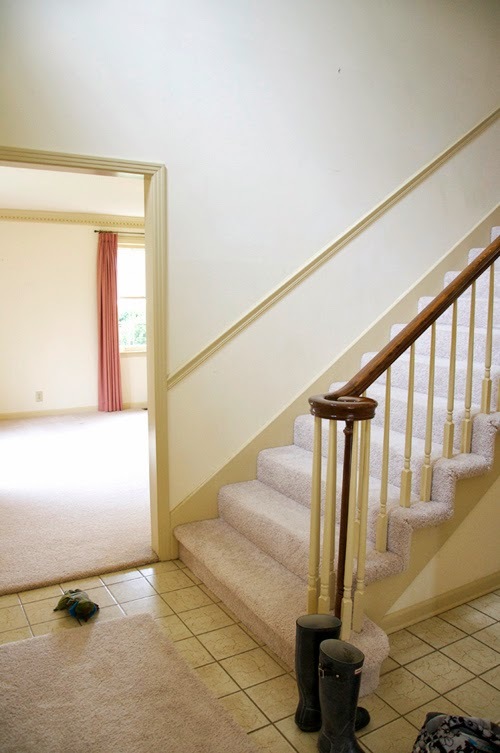 The main level also contains our garage, a guest room and a full bath, which are - surprise - also beige. Project de-beige the house is well underway over here! Let's take a peek upstairs, where our other three bedrooms are. Here's mine and Ben's - the others look just the same, only smaller and without dental molding :) We have an attached bath with a separate shower/toilet area, and a decently sized walk-in closet. I swear choirs were singing each time I opened it for the first few weeks. I've waited my whole life for a closet space like this! Oh, and here's a quick peek at the backyard. 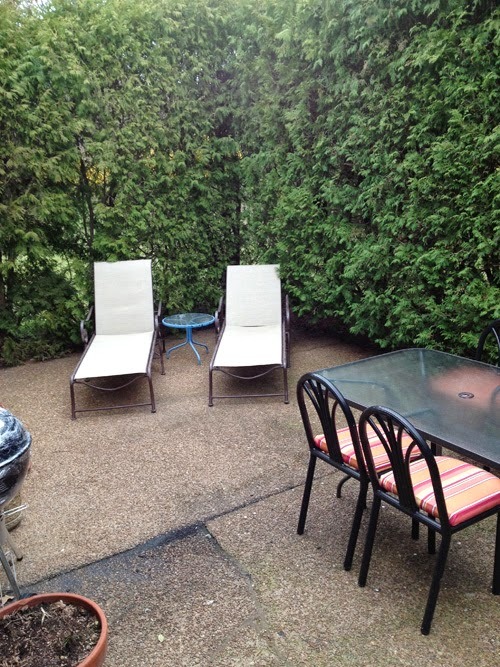 The patio was closed in by huge hedges when we moved in. I'll just say that things are a little different now. But that's a topic for another blog post. I can't wait to show you how things are coming together as we make progress with painting, updating and furnishing this space. 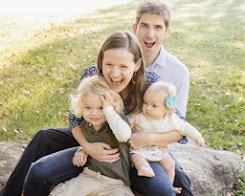 We're occasionally overwhelmed by the size of this house compared to our last one ... but then we remind ourselves that with two kids aged two and under, we'd probably be overwhelmed by about anything right now. And the yard - oh, the gloriously flat yard. SO much easier to mow and care for. Ben can knock it out in about an hour. No more run-away lawnmowers down a steep hill, or wheels rolling away or hours spent with a weed-eater in the little crevices and hills where a lawnmower couldn't drive. So yeah, that's a plus. Not to mention we have the sweetest neighbors (up and down our street) in the whole world. I definitely feel little pangs of sadness sometimes when I think about the memories we made at our last house, and the beautiful, updated kitchen we left behind. But then I head out for a walk on our quiet, pedestrian friendly streets, or take Max on a bike ride down the driveway without fearing he will go careening into a ditch, or chat with a neighbor in the street, or ... well, you get the idea. This move was the right thing for us, and with every little update and personal touch, this house feels more like our home.